The much loved cult comedy is finally coming back to the air, or to streaming. 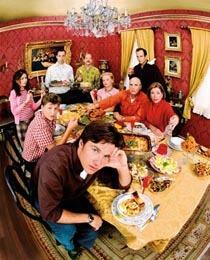 'Arrested Development' fans - in other words, pretty much anyone who has seen the show - are in for a treat. Creator Michael Hurwitz has announced that 10 new episodes are in the works. After talk of a film for quite some time, it's great news that we're getting even more 'Arrested Development' than originally promised. There are a few different bidders on the new episodes of the show, including Showtime and, more interestingly, Netflix. This pickup could be incredible for Netflix, a service that's known more for watching older content than new. Netflix has already outbid other companies on 'House of Cards,' but picking up 'Arrested Development' would be huge, not just for the streaming service, but for digital distribution in general. After all, this would be the first network show to make the switch from TV to streaming exclusively. And face it folks, Netflix needs a bit of positive press BADLY!